A discrete dynamical system is defined as a set of states on which a transformation acts, considered as an evolution rule. The terminology discrete refers to the time that is discretized: at time n corresponds the nth iteration of this transformation. Dynamical systems are widely studied, for their modelling as well as for their computation power. We will focus here more specifically on trajectories of chaotic dynamical system from a computer science viewpoint (finite or periodic trajectories). A classical example is provided by the links between the Gauss map, continued fractions and Euclid’s algorithm. We will also consider various application fields such as discrete geometry, quasicrystals, or else, computer arithmetics. 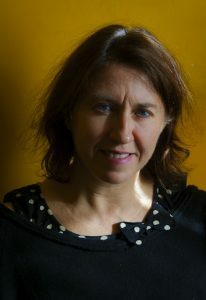 Valérie Berthé is a researcher in Computer Science at the French National Centre for Scientific Research CNRS, in Paris (IRIF, Univ. Paris 7-Paris Diderot). She works in combinatorics on words, symbolic dynamics, ergodic theory, and discrete geometry. She has been scientific officer at CNRS in charge of the relations between Computer Science and Mathematics from 2007 to 2010. From 2011 to 2015, she was Deputy Director of the FSMP (Foundation for Mathematical Sciences of Paris), and she is a member of the City of Paris’ Scientific Council and of the CNRS’s Scientific Council.